Treat yourself to a stylish new look with our latest range of Alchemy earrings! 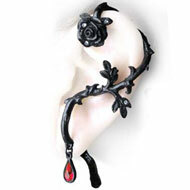 We have either new earrings by Alchemy Gothic, four of which you can see below. 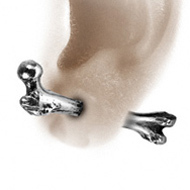 They are a great fake ear stretcher design that is unisex and can be worn in a standard ear piercing. Some look more like ear stretchers e.g. 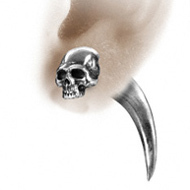 the Tomb Skull Horn, while others simply have a chunky profile and sit flush with the surface of your ear. Like all Alchemy earrings, these pieces are beautifully made using fine English pewter. 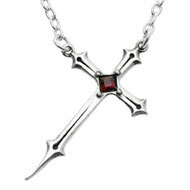 Each one is wonderfully detailed and features their signature blend of high gothic elegance. These earrings have high quality surgical steel ear posts, which means that they are very comfortable to wear and will not irritate your piercings. 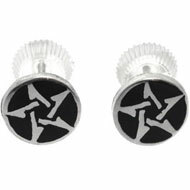 Starting at just £9.99, these Alchemy earrings make wonderful gifts and are a great way to show off your gothic style. This entry was posted in Ear Studs and Earrings and tagged Alchemy Gothic, Alchemy Gothic Earrings, Alchemy Gothic Jewellery, Ear Piercing Earrings, Ear Piercing Jewellery, Ear Piercing Studs, Earring, Earrings on September 6, 2013 by Piercing Guru. Turned off by heart-clutching teddies and generic Valentine’s gifts? 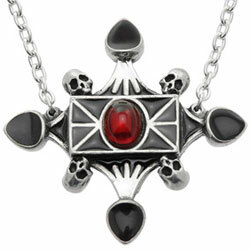 Check out our gothic Valentine’s Day gifts for a beautiful alternative. These gifts combine romantic designs with a darker edge, so you can still give a beautiful romantic gift, without compromising your personal style aesthetic. Whether you are looking for fine piercing jewellery or an elegant pendant, these alternative Valentine’s Day gifts are just perfect. 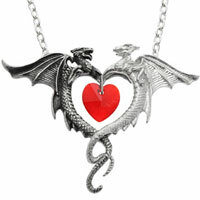 Alchemy Gothic make beautiful jewellery that is ideal for Valentine’s gifts. 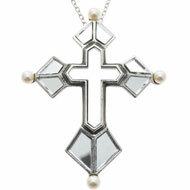 Many of their items are inspired by the darker side of romance; with dramatic gothic crosses and black hearts abound. Below are three of my favourite Alchemy Gothic pieces for Valentine’s Day. They all have a romantic aspect but are not limited to just hearts and roses. These pieces can be worn all year round and make a lovely token of your affection. 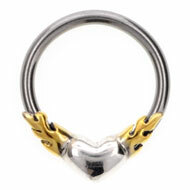 Heart-shaped piercing jewellery is always popular and these items are a great choice for Valentine’s Day. Our piercing jewellery is quite inexpensive, so you can afford to treat your beloved to multiple gifts, or pair them with a stunning bouquet of flowers. This entry was posted in Fashion Accessories, Festive Body Jewellery, Gifts and Accessories and tagged Alchemy Gothic, Alchemy Gothic Jewellery, Valentines Day, Valentines Day Gifts on January 24, 2013 by Piercing Guru. Limited Edition Alchemy Gothic Earring! 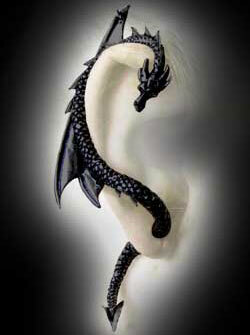 Don’t miss out on our Limited Edition Alchemy Gothic Black Pewter Dragon’s Lure Earring! This unique earring is strictly limited edition and available for a limited time only, so make sure you get yours today! 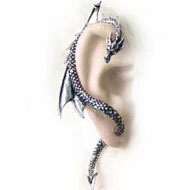 This stunning wrap earring is the best-selling Dragon’s Lure design, finished in sleek black pewter. It gives it a much more sinister look, with a creepiness that the silver version lacks. 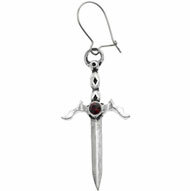 We only have a small number of these gorgeous Alchemy Gothic earrings, so when they’re gone they’re gone! This is a wrap earring but it only requires one regular sized ear lobe piercing to wear. 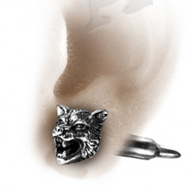 The dragon’s tail passes through your ear via a 1mm surgical steel bar, so it is very easy and comfortable to wear. The rest of the dragon simply hooks around the top of your ear. 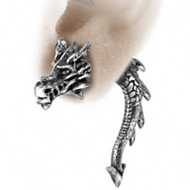 It is beautifully made and carefully balanced so that the dragon rests comfortably on your ear and stays in place. This earring looks simply amazing and it is the perfect way to show off your gothic style. 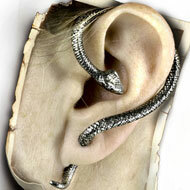 Alchemy Gothic make a whole range of wrap-style earrings, including the regular silver version of the Dragon’s Lure. It is equally beautiful and ideal if your prefer silver coloured jewellery. These are real statement earrings and they are very eye-catching. They are the perfect way to make an outfit feel special but they are easy to wear and comfortable enough to wear all day. 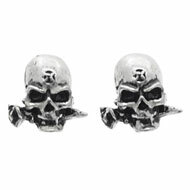 We also have a great choice of stud earrings and drop earrings by Alchemy Gothic, as well as some gorgeous ear cuffs. This entry was posted in Ear Studs and Earrings, Fashion Accessories and tagged Alchemy Gothic, Alchemy Gothic Earrings, Alchemy Gothic Jewellery on April 13, 2012 by Piercing Guru. Whether you go for dark elegance or gothic punk, Alchemy Gothic earrings are the perfect way to complete your outfit. 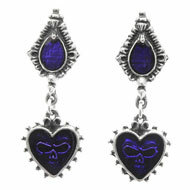 We have a fantastic choice of earrings by the granddaddy of gothic jewellery purveyours. These earrings combine fabulous details with a dazzling choice of gothic styles, from cutting edge to downright classic. All Alchemy Gothic earrings are beautifully made using either high quality surgical steel or sterling silver. These drop earrings are the perfect way to make a statement. Our Alchemy Gothic range has everything from blood tipped poison daggers to elegant angel earrings and graceful curves. We also have plenty of single drop earrings, so you can wear a mismatched pair or a stunning single earring. Alchemy Gothic’s stud earrings make it so easy to complete your outfit. They combine great gothic style with easy to wear designs and cute details that make any look feel a bit more special. Choose from classic skulls and pentagrams as well as girly motifs and extra sparkle. This entry was posted in Fashion Accessories and tagged Alchemy Gothic, Alchemy Gothic Earrings, Alchemy Gothic Jewellery, Drop Earrings, Ear Piercing Earrings, Earrings, Gothic Jewellery, Single Earrings, stud earrings on February 24, 2012 by Piercing Guru. So what do you buy for the stylish goth who has everything? Say hello to our brand new Alchemy Gothic watches! These gorgeous watches are new to Body Jewellery Shop and they really are something special. Alchemy Gothic watches combine excellent quality, beautiful workmanship and elegant gothic style that really stands out. The Razhora Razor Watch is bold, edgy and truly eye-catching. 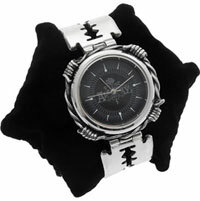 This watch features a very striking wristband made up of heady steel razor blades that wrap right around the wrist. The numberless black face features the Alchemy Gothic logo has a polished silver rim ringed in fierce barbed wire for awesome impact. New from Alchemy Gothic, the Barbarella Crystal Watch is perfect for any lady who loves razor sharp glamour. This gorgeous polished steel watch features a white dial framed with sparkling diamante. It has striking gothic flames are the tope and bottom of the dial that are very flattering to your wrist. 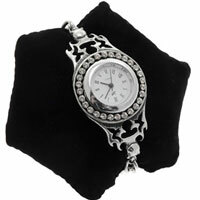 This watch has a lovely silver chain strap that looks delicate and elegant with any outfit. This entry was posted in Fashion Accessories and tagged Alchemy Gothic, Alchemy Gothic Jewellery, watch on February 21, 2012 by Piercing Guru. 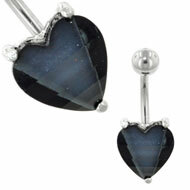 Give this Valentines Day a dark edge with heart-shaped gothic jewellery. Dark romance is a mainstay of gothic fashion and now is the perfect time to combine the sweet and romantic with something a little twisted. Alchemy Gothic have a great choice of heart-shaped gothic jewellery, including sweetheart earrings, vampire scared hearts and dark fairytale designs that really make a statement. Our Bleeding Heart earrings are just gorgeous. 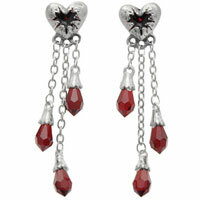 These stud drop earrings feature broken hearts dripping with blood red jewels. They are easy to wear but add real drama to any outfit. The chained jewels look very elegant and the red jewels really catch the light. Perfect for a little romantic glamour this Valentines Day. This entry was posted in Fashion Accessories and tagged Alchemy Gothic, Alchemy Gothic Earrings, Alchemy Gothic Jewellery, Alchemy Gothic Pendants, gothic, Gothic Jewellery on February 14, 2012 by Piercing Guru. It’s no secret that we are big Alchemy Gothic fans here at BJS and this month we have some truly gorgeous new Alchemy Gothic pendants to share with you. 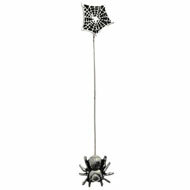 When you look at these pendants it is obvious how much the folks at Alchemy love gothic design. They are inspired by great women from history, classic gothic motifs and awesome steampunk detailing. We have a whole choice of new Alchemy Gothic pendants but these two are my absolute favourites! This sinister gothic pendant was inspired by Lucrezia Borgia, the femme fatale of 16th century Rome. The cunning and beautiful Lucrezia was accused of murdering those who got in her way, using poison. She was known for her jewellery and many believe that she had a hollow ring that she filled with poison. When someone displeased her, Lucrezia could simply sprinkle a little deadly poison into his or her drink. This pendant is also hollow, although we don’t advise you to fill it with anything deadly. 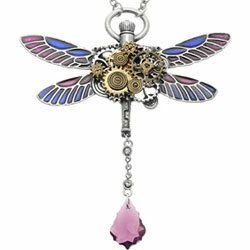 The Clockwork Darter Dragonfly Pendant is one of our most stunning pendants. 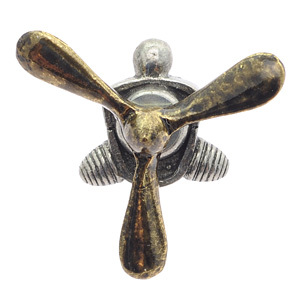 It combines intricate steampunk hardware with a graceful fin de siecle dragonfly. The brass cogs are very detailed and contrast perfectly with the elegant wings and enamel colouring. The fine decoration continues to the back of the pendant, which is engraved with wing sections and looks just as gorgeous as the front. Click on the image to see both sides. Suffice to say that this Alchemy Gothic pendant is a real statement piece and the perfect gift for anyone with a love of elegant steampunk. 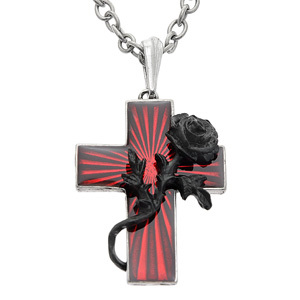 This entry was posted in Fashion Accessories and tagged Alchemy Gothic, Alchemy Gothic Jewellery, Alchemy Gothic Necklace, Alchemy Gothic Pendants, gothic, Gothic Jewellery on January 6, 2012 by Piercing Guru. Light up your look with a fabulous new Alchemy Gothic watch. Made from surgical steel, our eye-catching watches will definitely impress all your friends and family. The shimmering silver will look fabulous with your favourite jewellery, outfits and makeup. Make sure you give someone special a fabulous new watch. Make a bold statement with this fabulous Alchemy Gothic Razhora Razor bracelet watch which will light up your look and coordinate with all your favourite outfits. This shimmering steel watch with fantastic barbed wire detail will add a touch of edgy glamour to all your daytime and evening clothes. The strap of the watch has some eye-catching razor blade detail which will impress all your family and friends. This amazing quality watch with a black face and silver hands will instantly uplift your style and fit comfortably on your wrist. 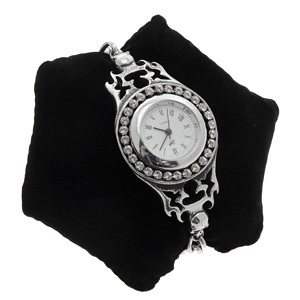 Whether you’re going to a party, day out or special occasion, you always feel stylish wearing this attractive steel bracelet watch which comes in a size S-M and M-L.
Add a touch of elegance to your look with this Alchemy Gothic Barbarella crystal watch. 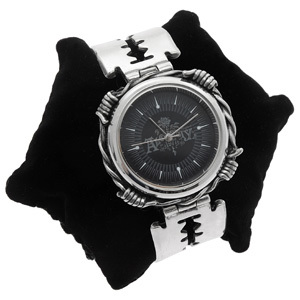 This steel watch with intricate gothic skulls and a razor blade edge will impress all your friends and catch the light wonderfully. The watch face is edged with stunning Swarovski crystals that will light up your look. Everyone will fall in love with this bracelet watch which will instantly pretty up your style and coordinate with all your favourite pieces of jewellery. Make sure you get one of these gorgeous handcrafted Alchemy Gothic watches which will update your style and make a lovely present for a loved friend. This entry was posted in Fashion Accessories, Gifts and Accessories, Surgical Steel Body Jewellery and tagged Alchemy Gothic, Alchemy Gothic Jewellery, watch on October 26, 2011 by Piercing Guru. With Halloween just around the corner our new alchemy gothic jewellery will look simply awesome with any costume and will bring a wave of gothic glamour to your style. Of course you don’t have to just wear alchemy gothic jewellery at Halloween, it looks amazing all year round, and is perfect for brightening up your day-to-day outfits with a splash of characterful design. Choose from our fantastic range of eye-catching earrings, necklaces and pendants each with fantastically affordable prices ideal for those with any budget. Alchemy gothic are a well known brand and each of their pieces is made to a high quality standard so you can be reassured you are getting a top of the range piece of jewellery. Make sure you take a look at our entire range as we have a great selection of matching pieces too. Choose an awesomely eccentric alchemy gothic pendant and get heads turning. Each of our pendants is designed to give you a wonderfully unique style and bring a touch of alternative glamour to your look. Below we have picked three of the latest additions to our alchemy gothic range to give you an idea of the elegant and out there style alchemy gothic jewellery offers. 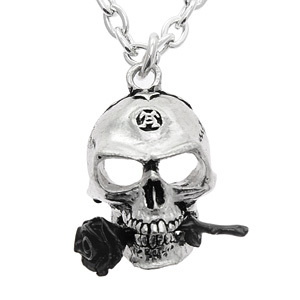 Our alchemy gothic the alchemist skull pendant is a fantastic choice for any occasion. It features a gothic skull face complete with dark rose between its teeth. It has a dark romantic feel that will define and brighten up your look in an instant. Indulge in a world of fantasy and mystery with the alchemy gothic a fairy’s dream necklace. The pretty design features a highly detailed fairy that is chasing a beautifully coloured dragonfly. 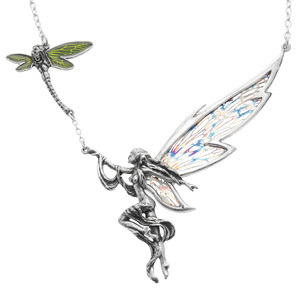 Beautiful colours in the wings of the fairy and dragonfly compliment the shiny finish of the pewter beautifully. This large necklace is perfect for adding drama and elegance to all your favourite outfits. 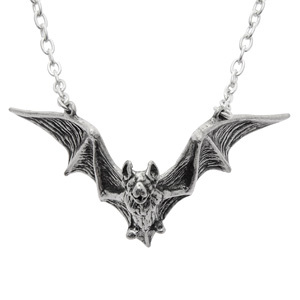 Be traditionally gothic with the addition of the alchemy gothic vampire bat pendant. It features an intricately detailed vampire bat in mid flight that is perfect for defining your style and showing your darker side. This chunky pendant will look great with a variety of costumes this Halloween and will bring style to all your outfits for the rest of the year. Each of these gorgeous pendants comes with a nickel free chain that is comfortable to wear and compliments the designs beautifully. Each pendant is expertly made from traditional English pewter for a glamorous antiqued/distressed finish that will get all your friends wanting one of their own. Brightening up your ear piercing with eye catching style is easy with a pair of awesome earrings from alchemy gothic. We have plenty of different designs to choose from that range from single earrings to pairs and large statement style to small subtle additions. Below we have selected three of our favourite earrings that will certainly cause a stir amongst your friends and family. 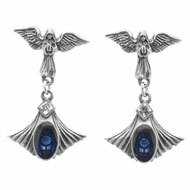 For the ultimate in statement style we have this fantastic alchemy gothic Daedalus pinna prop earring. It has a funky propeller shaped design that actually spins round for an awesome effect. This single earring is a great way to draw attention to your piercing and adds a splash of wild out there style to your look. A pretty addition to any look the alchemy gothic poison ivy drop earrings have a wonderfully detailed finished that incorporates a hint of gothic glamour too. 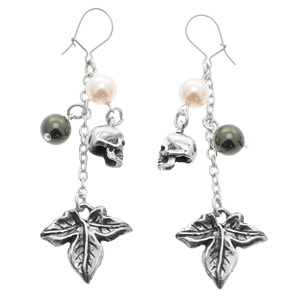 They have a drop of pearls and ivy leaves and are accompanied by a funky skull charm. They catch the light beautifully and bring elegance and glamour to your piercings. These earrings look wonderful when worn to parties and on nights out, as they will compliment your look effortlessly. 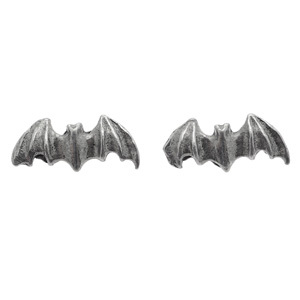 Small and subtle the bat stud earrings are a fantastic choice to wear on a daily basis. They have a pretty detail with an aura of gothic edge about them. They catch the light beautifully and will bring character to your piercings. Bats are the classic gothic motif and these earrings are perfect for incorporating them into your style on a regular basis. Easy and comfortable to wear your ears will look complete when adorned with these beautiful bat studs. Each of these earrings is crafted from traditional English Pewter and are finished with surgical steel ear posts and wires for complete comfort in your ear piercing. This entry was posted in Ear Piercings, Ear Studs and Earrings, Fashion Accessories and tagged Alchemy Gothic, Alchemy Gothic Earrings, Alchemy Gothic Jewellery, Alchemy Gothic Necklace, Alchemy Gothic Pendants, Drop Earrings, Earrings, Necklace, Pendants, Single Earrings, stud earrings on October 16, 2011 by Piercing Guru.